SpaceX on Thursday will attempt its first-ever cargo delivery to the astronauts living in orbit using a vessel that has already flown to space once before, the California-based company said. The launch of SpaceX's 11th commercial resupply mission aboard an unmanned Dragon cargo ship is scheduled for 5:55 pm (2155 GMT), and will be broadcast live on NASA's website. The gum-drop shaped Dragon spaceship has been refurbished, after previously toting food and supplies to the International Space Station in September 2014, and then splashing back down in the ocean intact. "The majority of this Dragon has been in space before," said Hans Koenigsmann, SpaceX's vice president of mission assurance. The heat shield, however, has been replaced, he told reporters at a pre-launch press conference on Wednesday. The re-use of an old spaceship is the latest move in SpaceX's long-running strategy to make space flight cheaper and more environmentally friendly. Its main effort has been in recycling rockets, by powering their first stage engines and guiding them back to Earth following launch. This saves the main portion of the rocket, and avoids jettisoning millions of dollars worth of equipment into the ocean after takeoff. About 10 minutes after Thursday's launch, SpaceX will attempt to land the first stage of the Falcon 9 rocket on solid ground back at Cape Canaveral. If all goes as planned, the cargo ship should arrive Sunday at 8:30 am (1230 GMT) at the space station, which circles the Earth at a height of some 250 miles (400 kilometers). The Dragon is packed with almost 6,000 pounds (2,700 kilograms) of science research, crew supplies and hardware. The supplies for special experiments include live mice to study the effects of osteoporosis and fruit flies for research on microgravity's impact on the heart. The spacecraft is also loaded with solar panels and equipment to study neutron stars. The weather forecast for Thursday's launch was 70 percent favorable, NASA said. If the launch is postponed for any reason, another opportunity opens at 5:07 pm (2107 GMT) on Saturday. 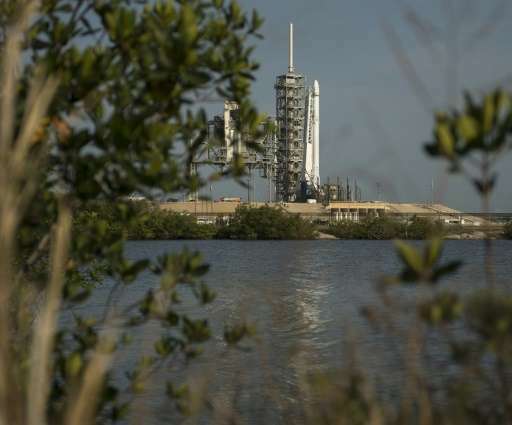 The launch will be the 100th from NASA's historic launch pad 39A, the starting point for the Apollo missions to the Moon in the 1960s and 1970s, as well as a total of 82 shuttle flights.